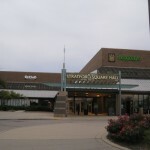 Stratford Square Mall is a large, super-regional center serving west and northwest-suburban Chicagoland. 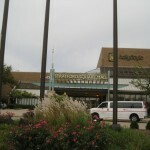 Located in the village of Bloomingdale, the mall is about 30 miles from downtown Chicago. 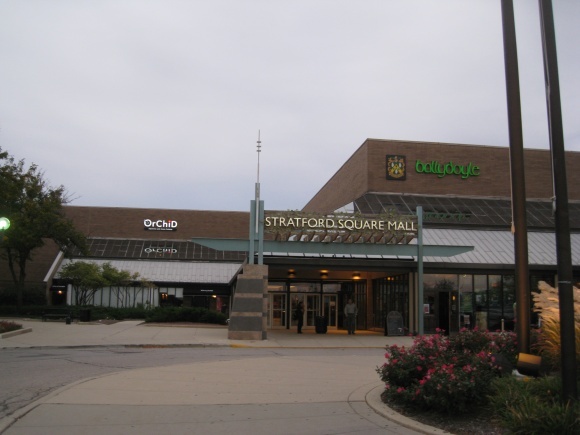 With 5 anchor slots and 1.3 million square feet of leasable space, Stratford Square is one of the larger malls in the Chicago region; however, the mall has faced recent struggles as it adapts to the economic downturn and general decline of large, enclosed malls nationwide. 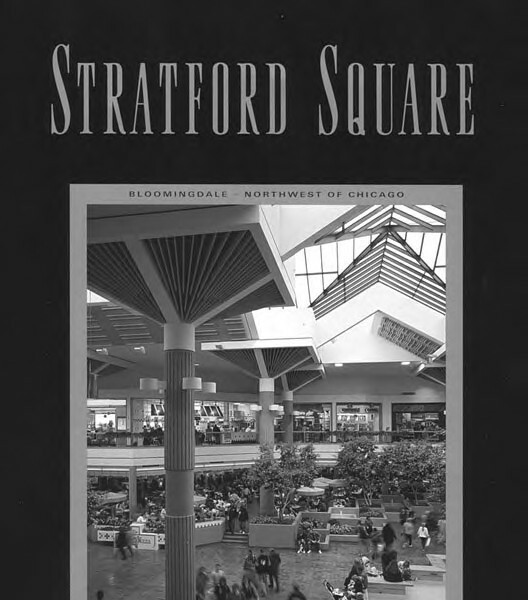 Opened on March 9, 1981, Stratford Square Mall was the end result of a planning strategy from one of suburban Chicago’s oldest settlements. Bloomingdale, which was located on maps as far back as the 1840s, is so old that the origin of its name is a mystery. The early settlers were German farmers, and Church services were held in German in the village as late as the 1960s. Things changed dramatically for Bloomingdale and northern DuPage County in the 1970s. The building boom around Chicagoland was in full swing, and Bloomingdale sat directly in the path of growth moving westward. As the original German pioneers established the small village core of Bloomingdale some 100 years earlier, suburban pioneers fleeing the city of Chicago began to move westward in the 1960s and 1970s. The core of the old village was very small, and located along Lake Street (U.S. Highway 20) at Bloomingdale Road. 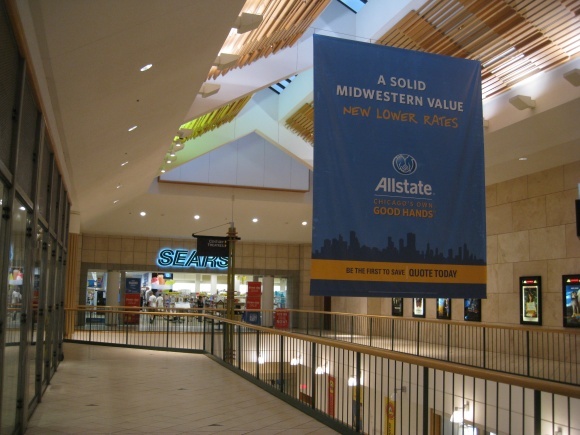 Suburban Chicago began to envelop the small village, and the residential suburbs of Glendale Heights, Roselle, Addison, and Carol Stream sprang up around it. 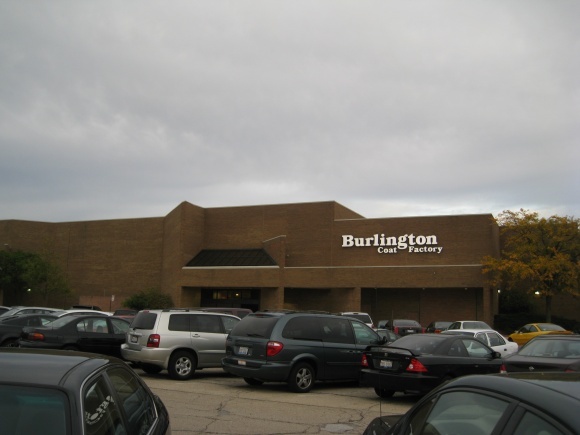 By the late 1970s, Bloomingdale wished to capitalize on all this growth and make itself a regional hub for suburban-style retail. 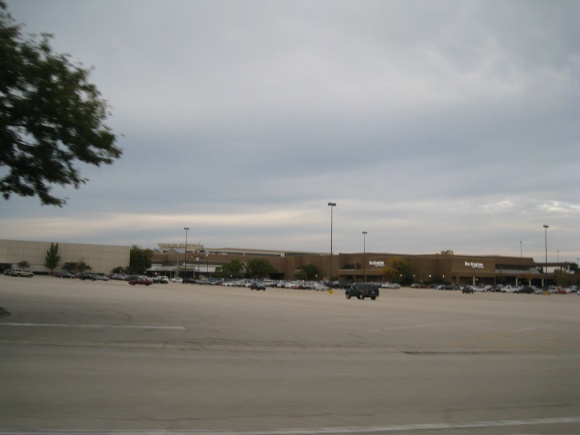 The center of this hub was to be a super-regional mall, located on the west side of the village at the intersection of Gary Avenue and Schick Road, just north of Army Trail Road. 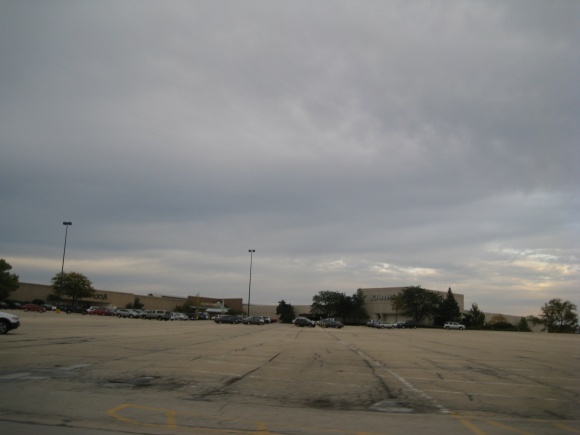 In building Stratford Square, developers sought to fill in this retail hole in the western suburbs, between the malls in Lombard and Aurora to the south, Oakbrook and the city of Chicago to the east, and Woodfield to the north. 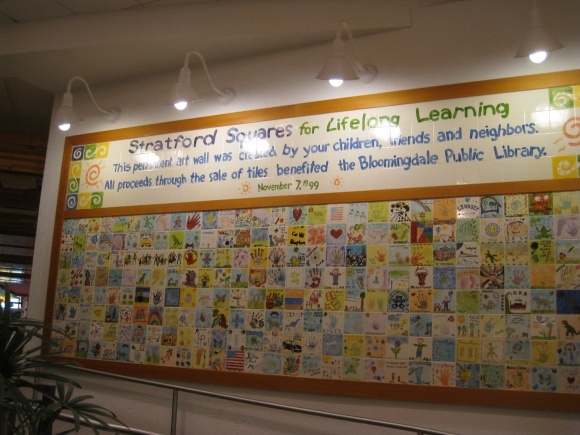 Stratford Square opened to instant success, and became the anchor it was intended to be for a massive retail corridor on the west side of Bloomingdale. 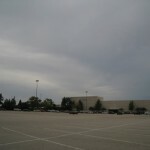 After Stratford Square opened, many big box-anchored strip malls opened in the coming years to complement the mall, mostly along Army Trail Road and Gary Avenue. 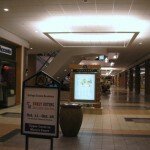 Unfortunately, though, this retail synergy between the mall and its retail environs peaked sometime in the 1990s. 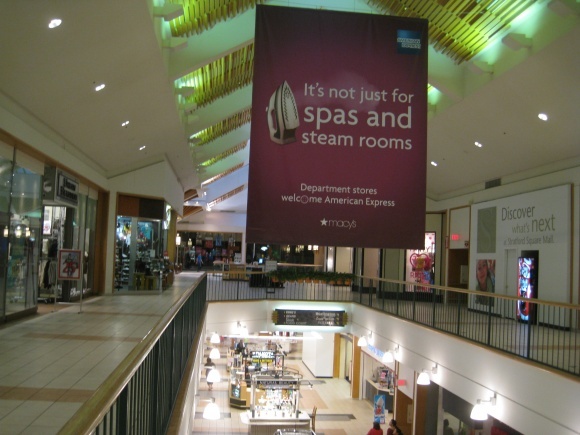 Beginning in the 2000s, Stratford Square and its retail corridor began to slide, punctuated by the departure of original anchor Wards in early 2001. 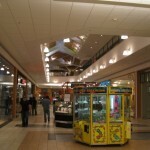 The slide was precipitated by competition, access, and national trends, and during the balance of the 2000s Stratford Square developed more vacancies and began a slide toward obsolescence. 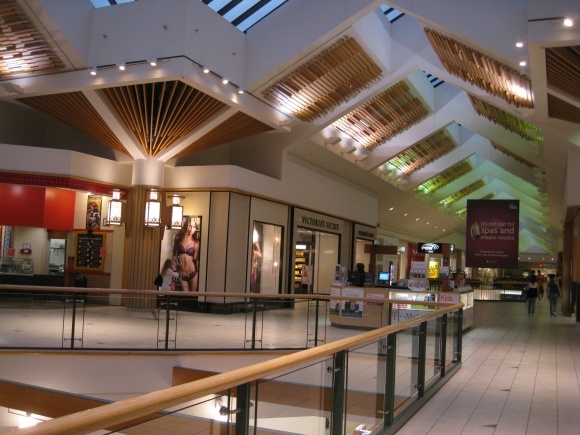 Let’s explore the impetus for Stratford Square’s decline, beginning in the 1990s with the arrival of fiercer competition and moving towards changing trends in retailing in the 2000s, with a separate focus on Stratford’s locational analysis. 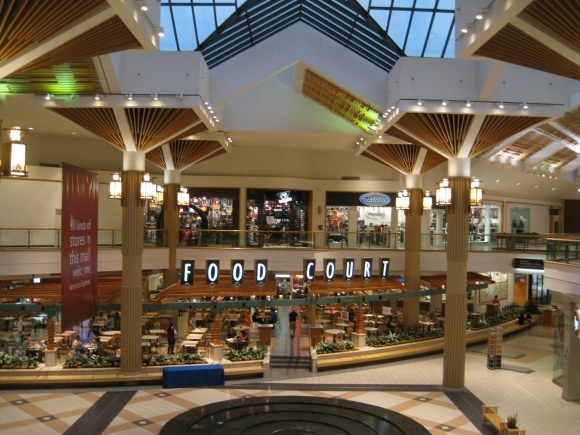 First, Woodfield Mall completed an overhaul and expansion in 1996, adding many new stores and a new two-level wing. 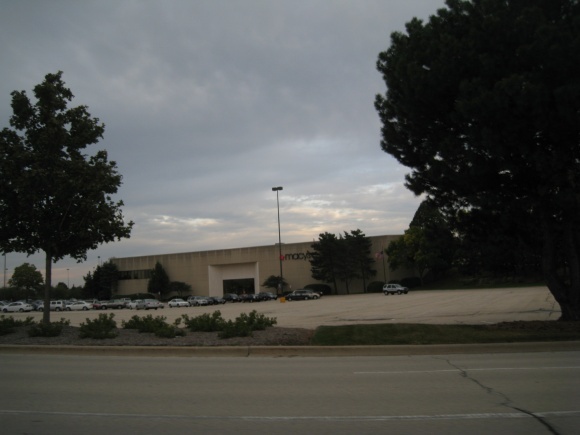 Following this expansion, Woodfield’s market dominance has continued to today. 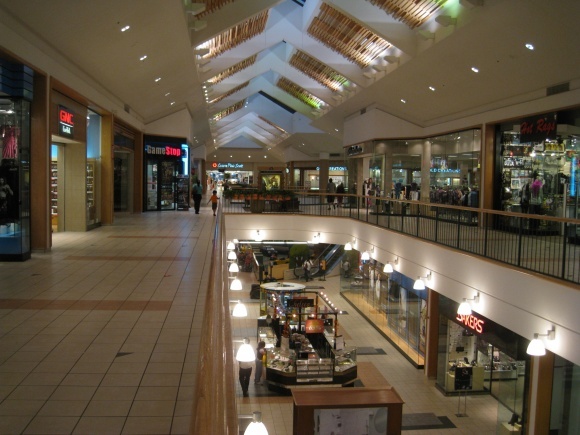 Woodfield’s dominance can also be attributed to a centralized location in Chicago’s northwest suburbs, located near the intersection of Interstates 90 and 290. 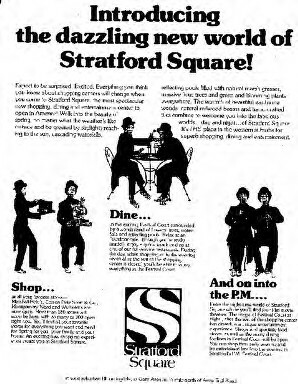 In contrast, Stratford Square’s location is slightly maligned. 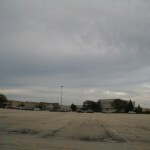 Like some other struggling Chicago-area super-regional malls (Randhurst, Charlestowne) Stratford Square is not located directly on any expressway or interstate highway. 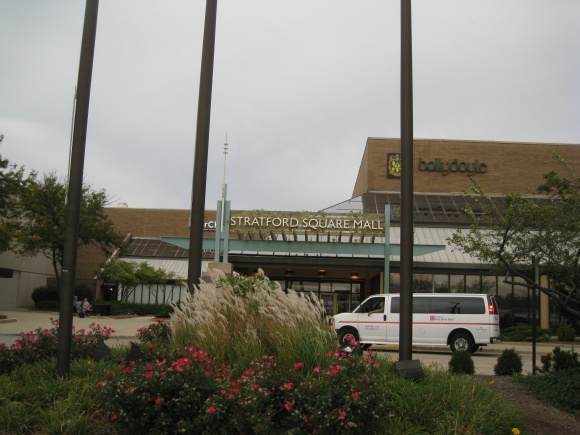 The closest major routes to Stratford Square are U.S. 20, a slow surface road with many lights, located a couple miles away, and I-355, a major north-south thoroughfare through Chicago’s western suburbs, located about 4 miles to the east. 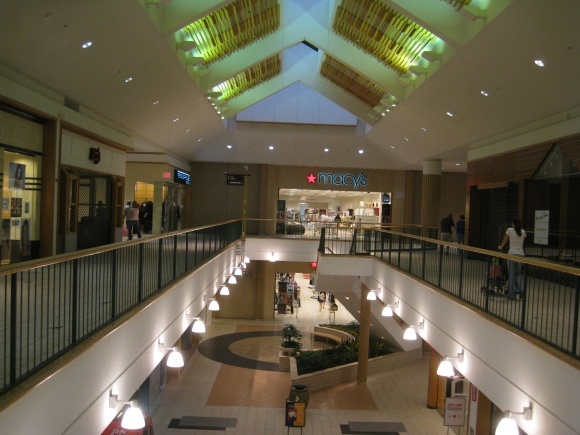 Also, national trends beginning in the 90s and 2000s rallied against super-regional malls, especially those that aren’t the top of their game like Woodfield, Oakbrook, Old Orchard, Orland Mall, and Fox Valley Center. 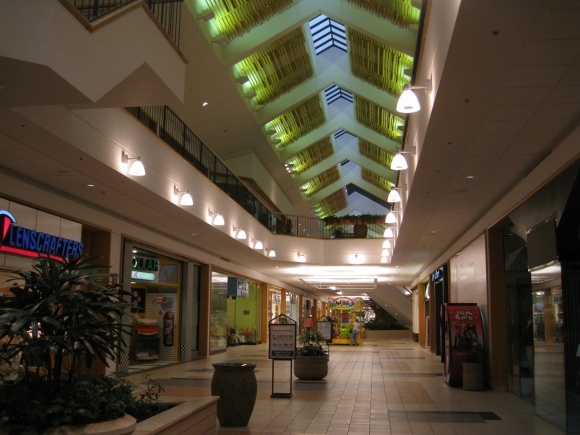 During the seemingly unending growth during the same period, too, many new strip malls and Lifestyle centers were constructed in the region, causing an overbuilding of convenience and leaving many of the older centers in and around the Stratford area to develop vacancies. All of these processes created a perfect storm for decline at Stratford. 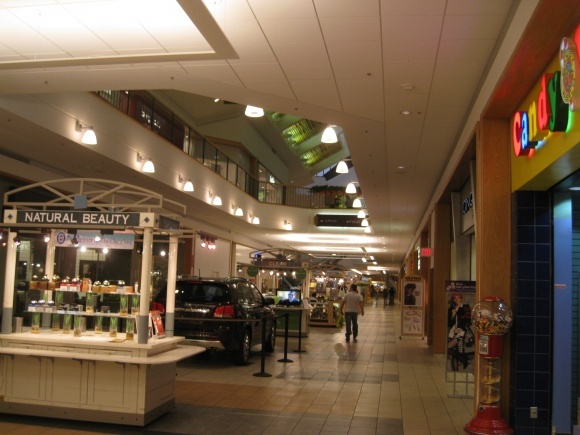 Basically, Stratford has become a regional center in the husk of a super-regional mall. 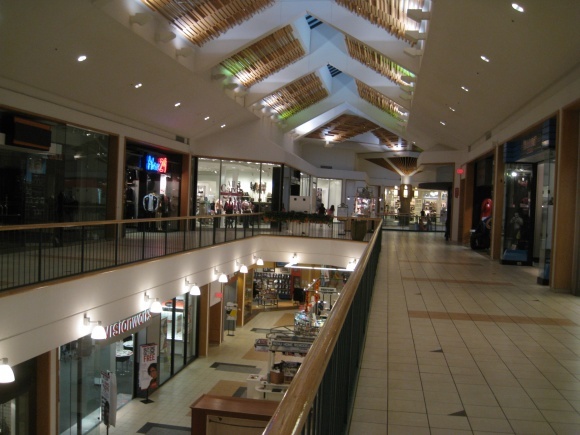 While parts of the mall are still successful and contain many popular national stores, other areas of the mall contain vacancies and many lower rent local and temporary stores. This is especially true of the Burlington Coat Factory/Carson’s wing of the mall, though it’s also visible in the Marshall Field’s wing. 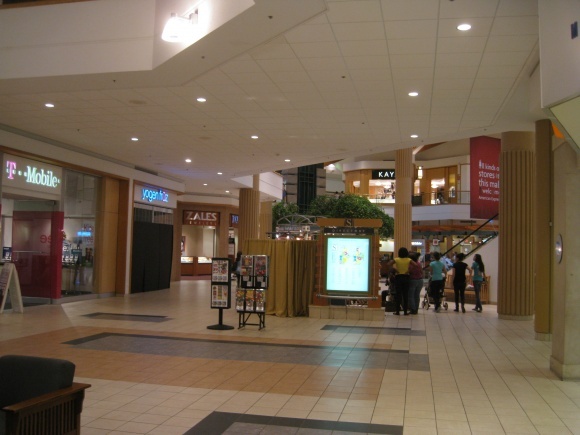 The center of the mall, which houses a popular food court, new mega-theater, and access to anchors Sears and Kohl’s, seems to be faring better. Many anchor changes and additions have taken place since Stratford Square opened 30 years ago. 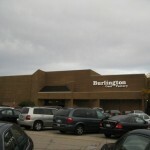 Wards was replaced in 2001 by Burlington Coat Factory, while another original anchor, Wieboldt’s, departed Stratford Square in 1987 but was quickly replaced by JCPenney. 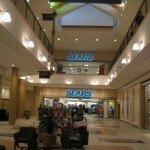 Also, Sears was added as the sixth anchor to Stratford Square in 1990, and during the 1980s a Main Street store was added to the mall, which became Kohl’s in 1989. 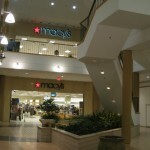 Original anchors Marshall Field’s and Carson Pirie Scott have remained, though Marshall Field’s became Macy’s in 2006. 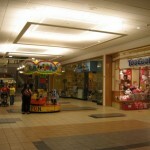 A Steve and Barry’s also operated at the mall from about 2006 until 2009, until that chain folded as well. 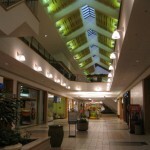 Stratford Square was most recently sold in 2005 to Feldman Properties, who immediately embarked on repositioning the aging center. 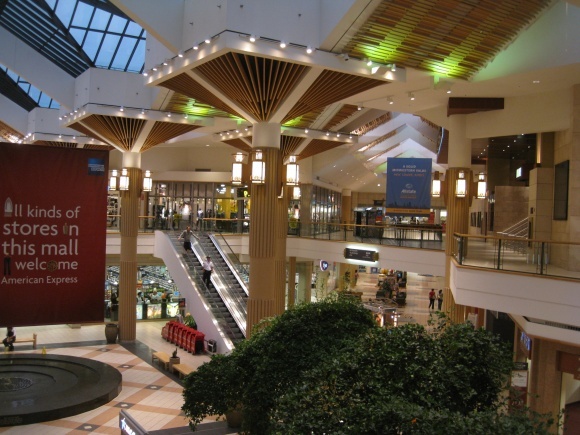 They bought the mall for just over $93 million, and at the time the mall’s occupancy rate was 90%. 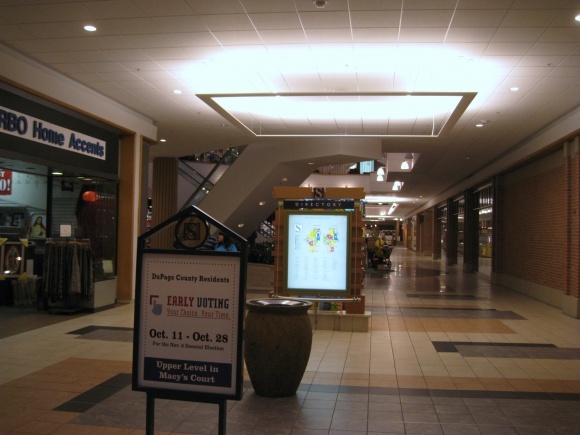 In 2006, Feldman purchased the mall’s JCPenney anchor for $46 per square foot, leasing it to JCPenney. 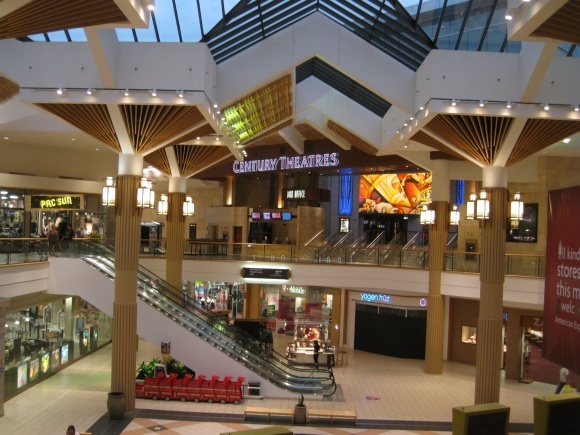 The mall was renovated, and the existing 4-screen movie theater was quadrupled in size to a mega-sized all digital 16-screen experience, featuring a cappucino bar, marble flooring, and stadium seating. The theater opened July 4, 2007. 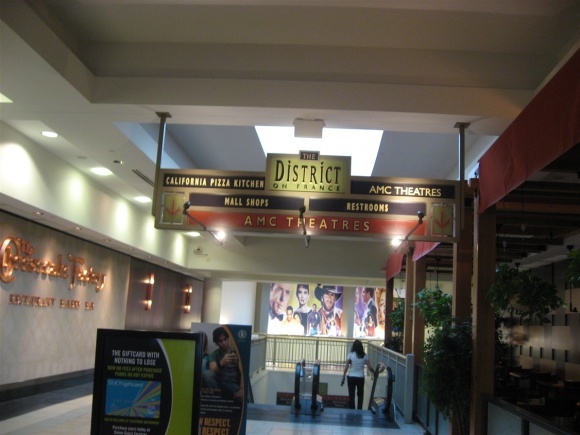 In addition to the theater, Feldman hoped to transform some of the exterior entrances into clusters of popular restaurants, much like The District on France, a strategically-positioned cluster of destinational restaurants at Southdale Center in suburban Minneapolis. Unfortunately, though, the envisioned clustering never fully materialized; however, several restaurants have opened, like Orchid (Asian), Ballydoyle (Irish Pub), and Red Robin (Burgers). Also rather unfortunate is the economic downturn of 2007 and beyond, which robbed Feldman of access to capital and put it in some real trouble. 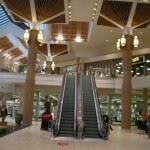 In 2008, Feldman attempted to dump Stratford Square, as well as several other malls in their portfolio, to a company called Inland American. 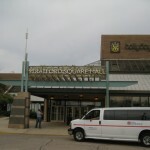 In early 2009, however, the deal fell through, and Feldman ultimately kept Stratford Square as well as a mall in Ohio, until it was put into receivership. 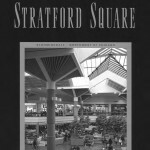 Today, Feldman still owns Stratford Square as the only property in its portfolio. 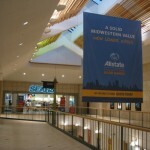 Feldman also operates an outdated leasing website for Stratford Square, including a slide show featuring the completed movie theater and some of the proposed changes; however, many of the touted “high-profile” tenants have since left the mall under Feldman’s tenure, including Abercrombie and Fitch, Forever 21, Gap, Disney, and American Eagle. One slide in their presentation (fast forward a few slides, it’s a Flash page) does strike a chord with potential viability, though. It outlines the hub and spoke structure of Stratford compared with its environs, outlining the incomes, population, and traffic counts in the area. It also labels all of the strip malls and big box anchors along Gary Avenue and Army Trail Road near the mall. Strikingly, the household income in the area is around $100,000, and the 5-mile radius population is 263,000. 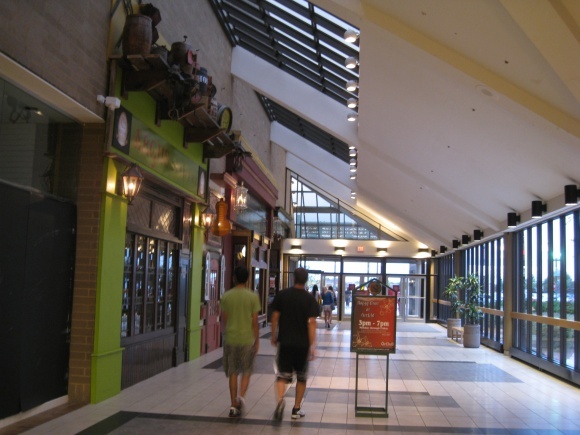 At 5 miles, these residents are far closer to Stratford Square than any other retail center, so the center should be able to easily capture these residents and thrive as a regional mall. 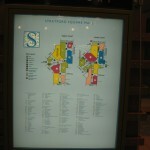 The only problem with this is that Stratford is built to be a super-regional center, and draw shoppers from 10+ miles. While the 10 mile radius population is over 850,000, many of these residents are closer to Woodfield, Yorktown, Geneva Commons, and other options. A possible solution, when the economy allows for it, would be to complete Feldman’s idea of creating destinational restaurants, and possibly adding more entertainment venues. I know the Ballydoyle here has popular musical acts and is open late, sometimes even featuring American Idol alum Gina Glocksen. 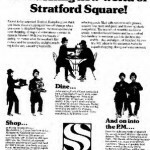 We’ve visited Stratford Square several times over the years, and have also noted the slow decline in popular national brands. 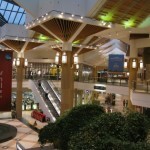 And while this mall is far from defeat, we’re a bit saddened at the lack of focus for its renaissance. While it’s true that Stratford isn’t that close to expressway/interstate access, it is the center of a densely populated, relatively wealthy suburban region. A little TLC can go a long way in these cases, and once the economy perks up I fully expect Stratford to rise from the retail ashes. Hopefully Feldman, or whoever owns it at that point, can find more capital to perk the place up, and diversify its offerings to get people in the door. I have every confidence that it’s possible. 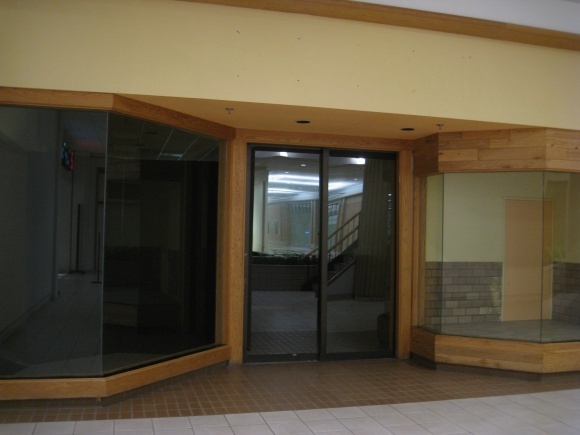 I captured these photos of Stratford Square Mall in Fall 2010, except for the three older ones I took from the Bloomingdale library’s site. 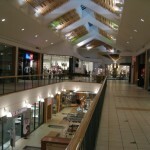 Feel free to leave your own comments and thoughts on the mall. I live in Stratford, London strangely enough, and we’re getting a 1,900,000+ square foot Westfield Mall to compliment the 2012 Olympic Park next door, which is due to open this fall. 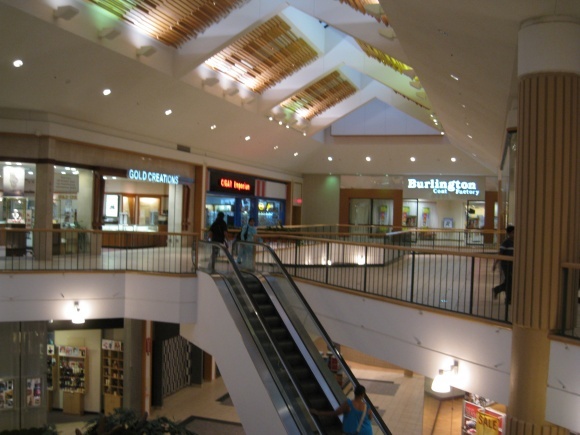 I have to say that having seen the plans I think I prefer its namesake mall in Bloomingdale. Ours looks like its going to be quite a ‘cold’ place – nowhere near as attractive as this one, with its lovely wood features. I love those lamps on the main pillars too. 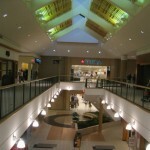 I used to work as a manager at one of the stores at Stratfiord Square in the early 1990’s and loved the mall. It was such a lovely place to work at the time. 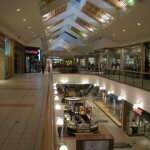 At the time the mall was close to 10% leased and had a fantastic mix of stores. I loved seeing the photo’s here but was saddened to see that the fountains in the main court area were gone. 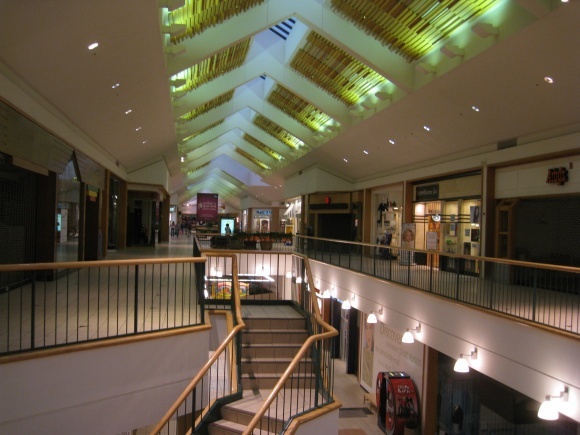 I always thought that was a distinguishing feature of the mall along with all the woodwork that made the mall seem so warm and inviting. I also believe at the time I worked there the flooring was a darker tile than the white in the photos. 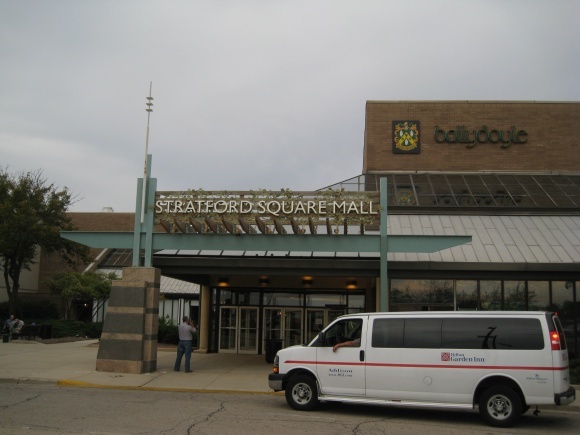 I’m somewhat saddened to see Stratford’s decline, as I used to go there a lot when I was younger, as it was the closest mall with actual department stores in it (Fox Valley was a more difficult drive from home). It’s still easier to get to, but has less selection. @Scott, there is one fountain in the center court now-it’s a little more modern looking than the dated seventies style stepped ones. Hey! Great article & pics! Brought back a lot of memories of when I lived in the area back in late 1990-1991. I remember eating at that closed Arby’s near Marshall Field’s. 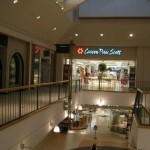 The Field’s store at Stratford Square was a duplicate of the store at Spring Hill Mall in West Dundee, only having mall entrances on both levels instead of one. 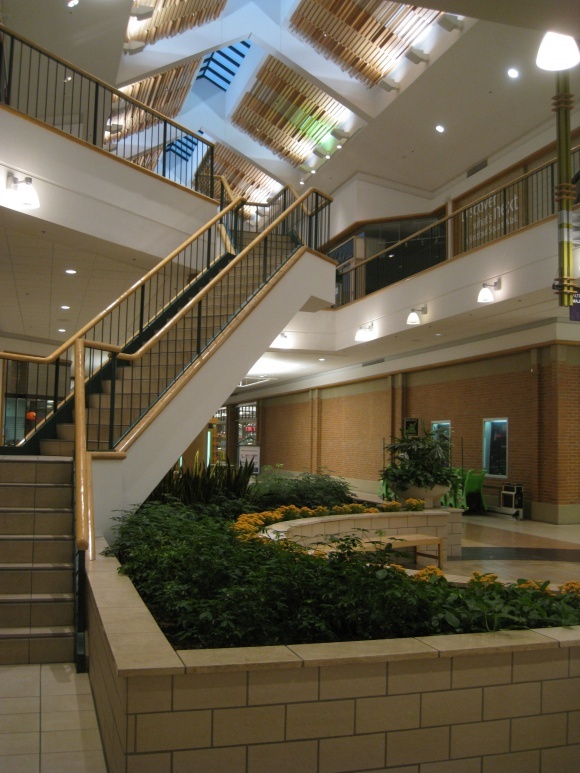 It’s too bad that they removed the stepped fountain and planters in the center court area between Kohl’s & Sears; it was pretty cool looking back then. I remember being in this Sears store during it’s opening week, summer 1991. 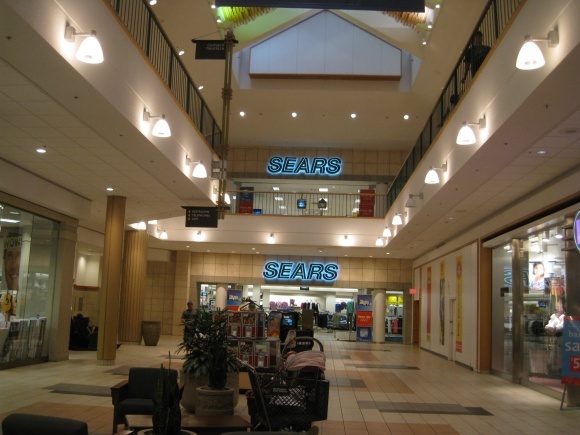 At the time, it was a nice, newer-look Sears. this was also the first Kohl’s store I ever visited. 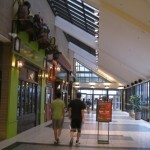 Sad that this mall is having occupancy problems; back in 1991, it was doing very well & had a lot of good stores. Hopefully, things will maybe turn-around for it. Again, thanks for the memories! Actually, it got a Sears at the same time as Ford City, and Chicago Ridge got a Wards. 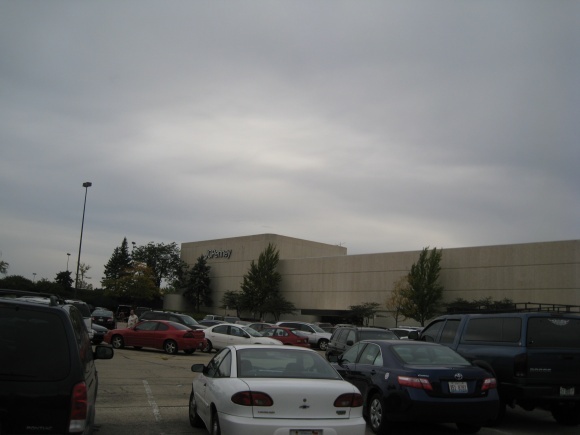 Then Lincoln Mall got a Sears in 1995. Same as some of the above posters, I too lived in the area in the early 1990’s and remember the mall doing very well…though it did always strike me as kind of odd how close geographically it was to Woodfield…by the time you made it through all the stoplights on Army Trail, you coulda been shopping at a great mall as opposed to simply a good one. 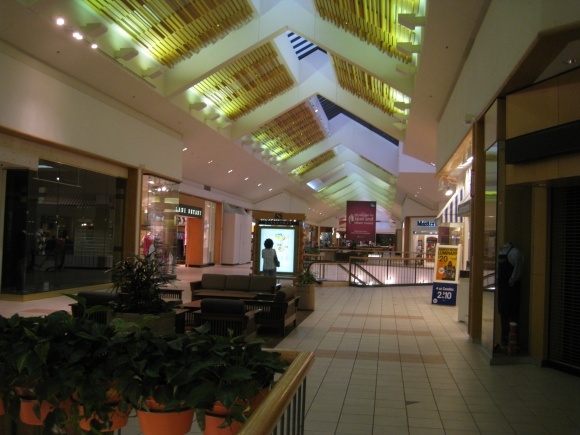 And Woodfield and Oak Brook always drew very well as far as out-of-towners, “the Strat” was largely DuPage County locals. 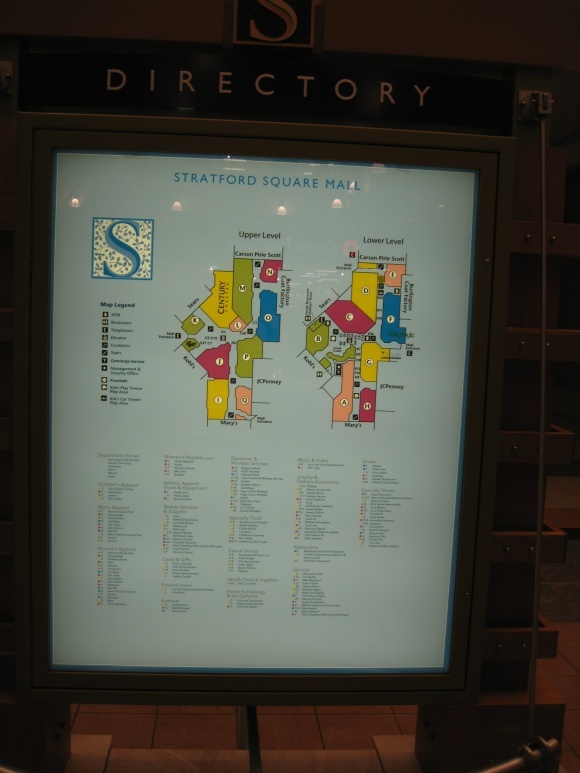 I was just at Stratford Square over the weekend. This has got to be one of THE weirdest malls I’ve ever been to. It’s very pretty (and clean) inside…I love the wood beams in the ceilings! 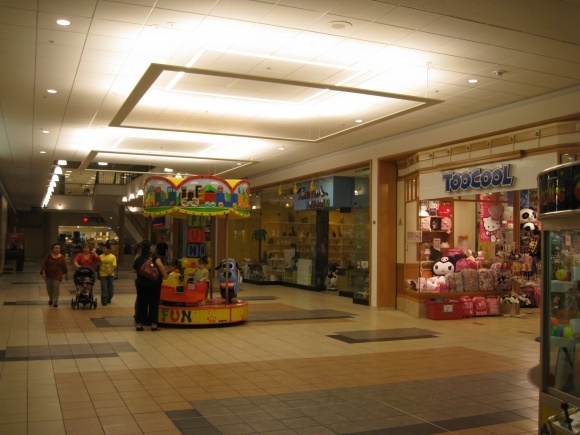 But you can also tell that this mall really had something going for itself and that something has declined over time. Stratford Square seems to have too many urban/ethnic tenants and not enough national ones, and the national stores that are there have very outdated exteriors. 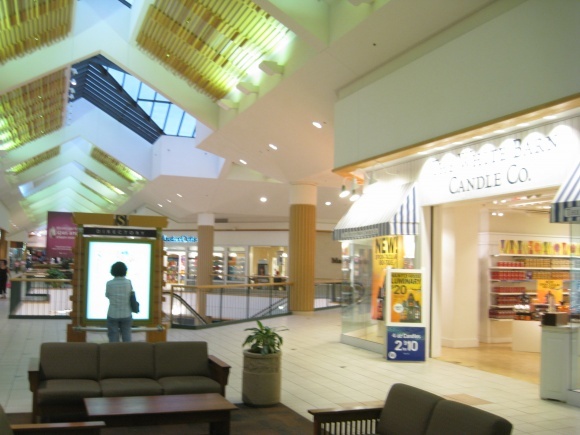 Take a look at Bath and Body Works…still looks like a farm/fruit stand…they’ve remodeled since then! I also don’t understand the purpose of this mall. It’s not on a main road, and it’s 20 minutes away from Woodfield. 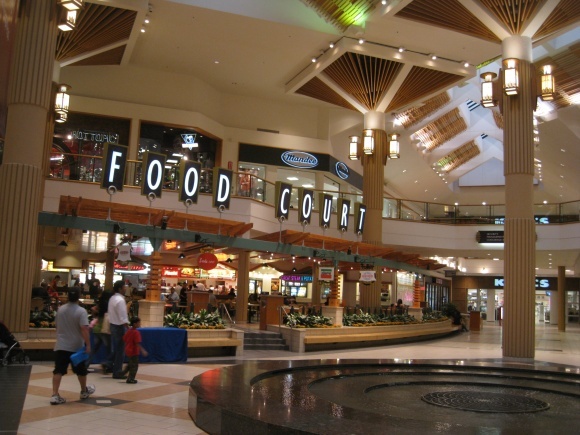 Woodfield is a HUGE mall…but then so is Stratford Square. 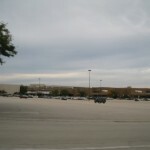 Seems to me that 2 big malls within such close proximity of each other would be bad…one mall would ultimately fail. 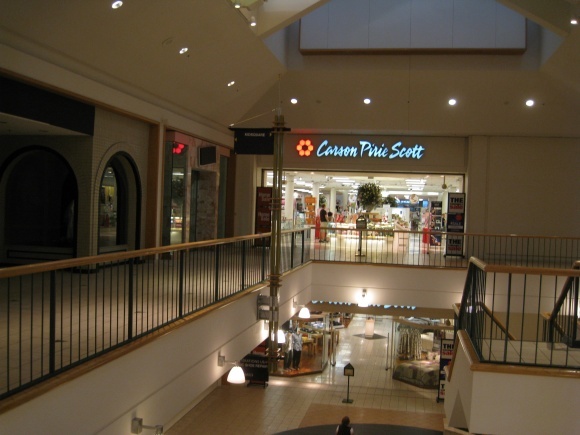 When built, Stratford Sq had Carson’s, Wieboldt’s, and Ward’s, all stores not found at Woodfield which had JCPenney, Sears, and Lord & Taylor – Field’s was common to both malls from the start. 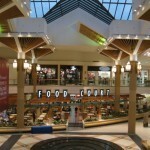 It seems to have been built as a locals mall while Woodfield was the tourist attraction. @Brandon, It was unusual for Field’s to co-locate with Carson’s or Wieboldt’s. there only branches near a Wieboldt’s were in the old downtown districts of Evanston and Oak Park/River Forest. I don’t think they had any overlap with Carson’s prior to the last 10-15 years. the only overlap with Wards was former “The Fair” branches (Oak Park/River Forest and Old Orchard). 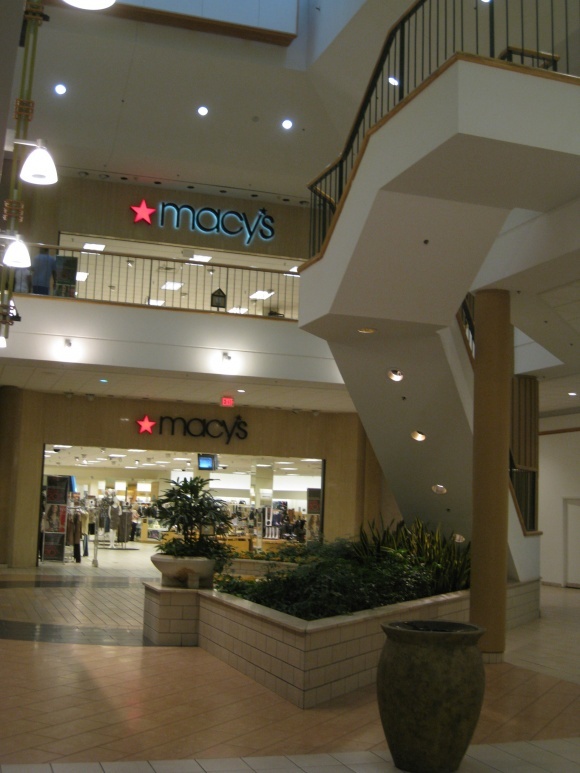 Field’s pattern was to co-locate with Sears and/or upscale dept stores like Lord & Taylor. The mall was more an anomaly than typical. 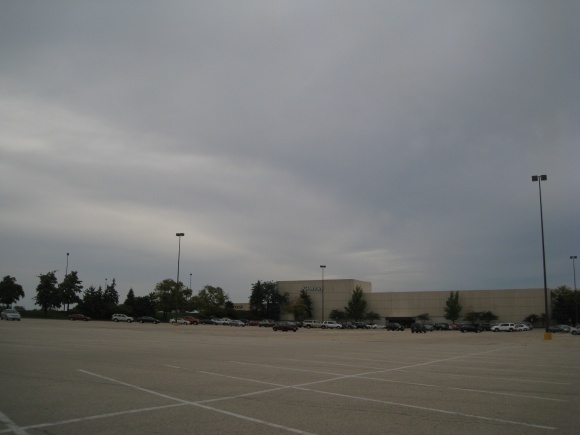 It may have evolved out of an earlier plan for Wieboldt’s, Carsons, & Wards to develop a mall in the western suburbs (Addison, I believe); those three were jointly involved in development of Randhurst, Lakehurst, and Lincoln. Fields did have some overlap with Carson’s for the past 30 years, though little early on. Orland Square opened in 1977 with both Field’s and Carsons, River Oaks had Fields and Carson’s came in in the late 70’s (replaced the Edward Minas store). More of the overlap did come though later- Carson’s replaced Lord and Taylor later on at Hawthorn, and then Fox Valley. 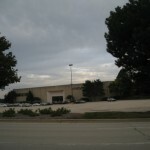 Joliet had both but the Carson’s was originally a Bergners. @kurt, You’re taking my post a little too literally. 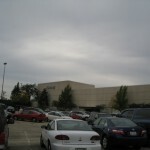 When this mall was conceived and built, it was unusual for Field’s to co-locate with any of its local Chicago competitors. This makes the mall a historical novelty. 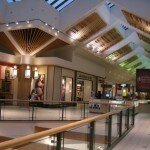 Clearly, they saw the marketplace as being able to support more than Woodfield. 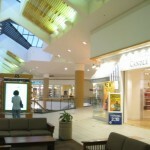 Carson’s entered Field’s dominated malls later and mostly via acquisitions of other chains’ castoffs. They were a natural for River Oaks given their long presence in northern Indiana. Other than Goldblatt’s, no other Chicago chain had bothered with that market. @Brandon, Yeah I can totally understand SSM being a mall for the locals and Woodfield being a tourist destination. 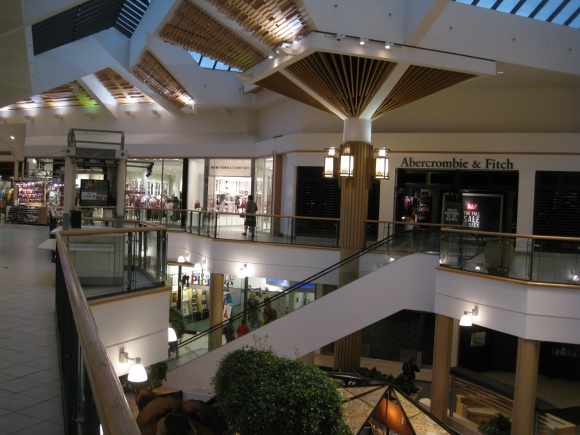 For me, personally, Woodfield is (and probably always will be) my mall of choice. @Anonymous, Stratford is a lot easier to get to than Woodfield, at least if you live much further west than Bloomingdale. I lived in Geneva and Schaumburg is a royal pain to get to, and the traffic near Woodfield is atrocious. I only went there if I had to. Completely unenjoyable to me. @Doug, I’m with you. I’m on the east side of St. Charles but Charlestowne is just too depressing. 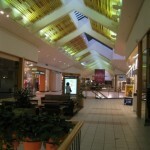 Stratfords got most everything I usually need in a mall. So a quick 20 mins east on Rt. 64 and I’m right there. It’s clearly not doing awesome but it’s not falling apart either. 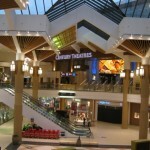 It can even be crowed there on the weekends like before Easter, so that makes it a live mall to me. Stratford Square has some of the most stunning architectural details. If it folds, it’ll be a sad day. 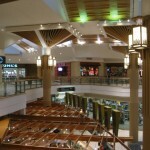 I actually prefer malls with less national retailers and more local ones. A Gap is a Gap is a Gap, no matter where you are. @Scott, Except there isn’t a Gap here anymore. There is a storefront that you can tell was a Gap at one time, but it’s been replaced with some independent shop. 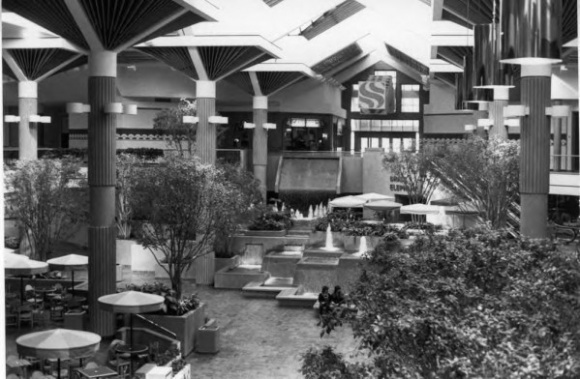 As a child of the 70’s, my favorite parts of the malls were not the stores, but the fountains and gardens and decor. Christmas time was always wonderful in the mall as every inch seemed to be covered in fake fluffy white snow and animated figures. 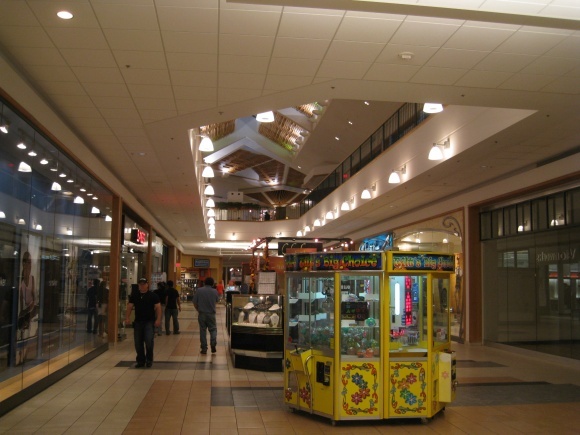 As a child, I couldn’t pronounce the name of the mall, and it came out as “Scraps and Squares”. Still call it that today. 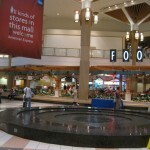 The most tragic loss of the mall’s character was the elimination of the fountains, ‘pond’, and depressed seating areas. The center court area was actually a large pool of water. The elevator sat on the edge and there were a few floating planters and trees planted in concrete cubes nearby. 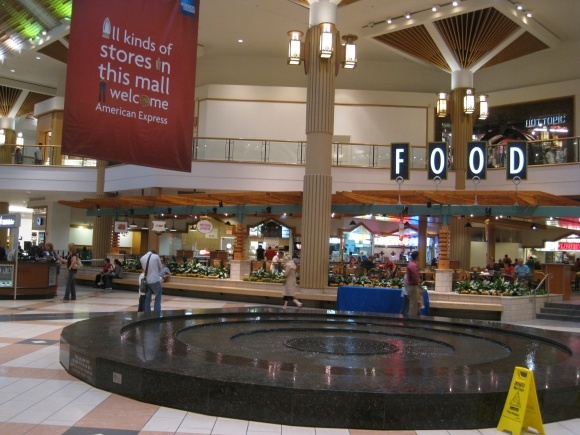 The Carson’s & Fields ends of the mall had seating areas which included little “Trolls” spraying water into tiny fish ponds. 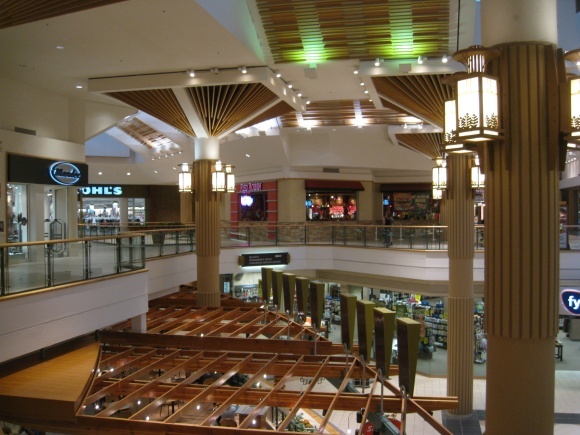 The mall was typical design of the era with lots of wood and earth tones. Adjacent to the food court was the awesome waterfall and fountains. 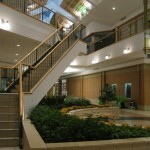 This area also has a “mezzanine” level between the first and second floors. That was the location of a multi- screen theatre facility and a restaurant. I could go on and on about this place. 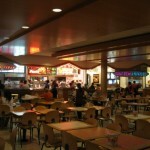 The Magic Shop (I believe owned by Marshall Brodien of BOZO TV fame), the pet store and of course the food court! I went back a few years ago to see what was left and was totally disappointed. I haven’t returned since. I’m going to post a link and embed the image (if it works) of a 1981 press photo showing the mezzanine level with escalators and before any tenants moved in. 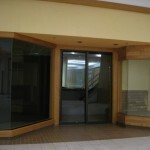 You should be able to see the red/green logo walls that blocked the store fronts until the tenants were ready to open. @Berwyn Mike, OMG! Thanks for posting that picture. 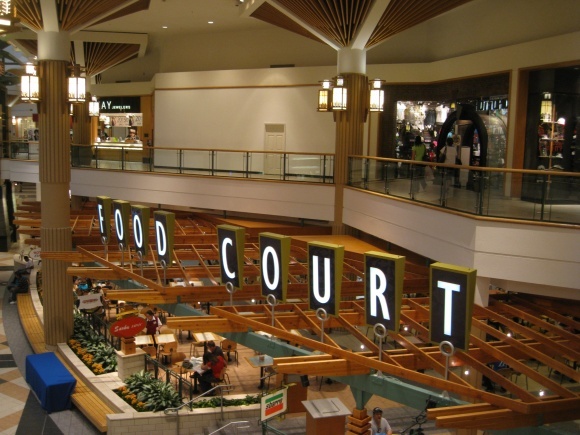 This was the only mall my mom and dad would take me to and I loved it! I still remember those Trolls and the ponds. I also remember when they took all of that off and built that fountain that shoots water straight up. I’ve lived in Glen Ellyn, IL for 12 years, and our village is about equidistant from Stratford Square and Oak Brook Center. In those 12 years, I have been to Stratford two times and to Oak Brook too many times to count. Somehow, Stratford seems to lack the class and panache of Oak Brook. 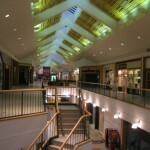 The stores at Stratford can be found in Any Town, USA. 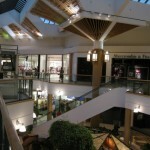 The stores at Oak Brook, on the other hand, are a notch above the usual mall store assortment. 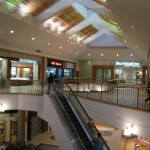 The two malls have the same middle to upper middle class demographic, but Oak Brook is special while Stratford is most ordinary. I too live in Glen Ellyn but work in Carol Stream about two miles south of Stratford, so Stratford is IT if I need to grab something from there during my lunch. Craftsman tools, for example. Hmmm, I recall driving all the way up to Woodfield many years ago to shop at Sears; I hadn’t realized Sears was a somewhat-later addition to Stratford. Anyway, yes, before the construction of Stratford Square, the Gary Avenue corridor was nothing but open farmland from just north of North Ave. (IL 64) all the way up to Route 20. 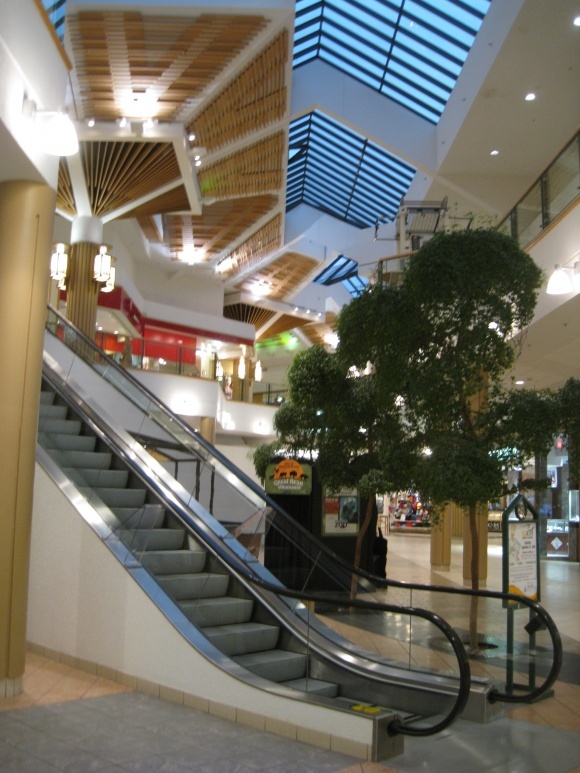 Now its ALL built up – besides Stratford Square there are miles and miles of big box stores and strip malls, and residential subdivisions. I wish I could go back to the late 70s and get some pics! Unrecognizeable. 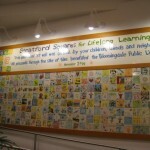 My father was head engineer at Stratford from its opening in 1981 until he retired in 2008. My siblings and I pretty much grew up at the mall; from spending sick days in my father’s office, to sitting on the on the roof watching the Bloomingdale fireworks. 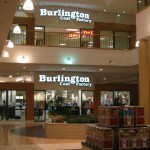 And for a few years, all four of us (my siblings and I, and my father) all worked in various parts of the mall. I have very fond memories of Stratford, especially of all the original fountains and Santa’s Village at Christmas. 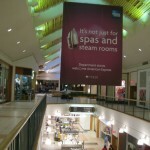 As nice and much needed as the renovation to the mall were, it was never the same after that. 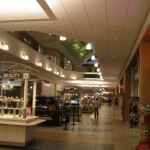 I really hope that someday a new owner will be able to revive the mall, it would be a shame to see it close. 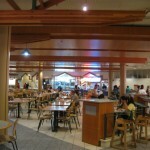 @Michelle – do you remember the name of the Greek restaurant that used to be located on the 2nd floor? 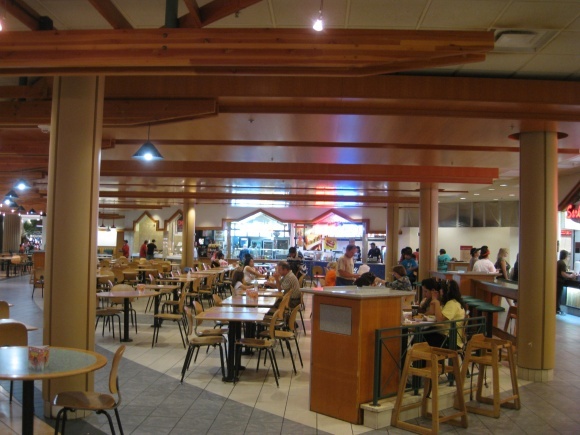 I don’t remember where exactly it was at, but same here – I used to practically live at this mall (my mom was a store manager at August Max Woman) and before that we used to go to this little Greek restaurant to have saganaki. But I can not remember the name of it and I’ve been trying to research it everywhere! Perhaps your father would remember? @D, The Greek restaurant was named Taverna and was located in the section that’s now the bigger Century Theaters. A second Sbarro was next to Taverna and Earl of Sandwich was close by. @D, The Greek restaurant was named Taverna and was located in what’s now the larger Century Theaters. 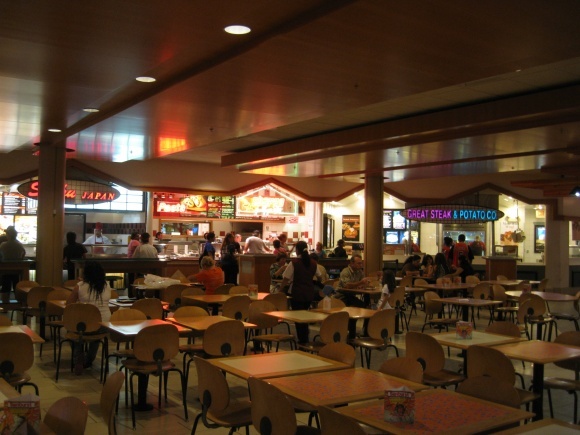 Sbarro had a second location next to Taverna with Earl of Sandwich close by. @D, The Greek restaurant was named Taverna and was located in what’s now, the larger Century Theaters. Sbarro had a second location next door and Earl of Sandwich was close by. @Michelle, Do you know what the “Stratford” Square Mall was named for? Was it a place or someone’s name? 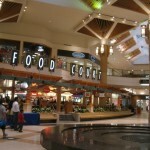 If that 100,000 dollar income fact is true, this mall is a major anomaly, to say the least. 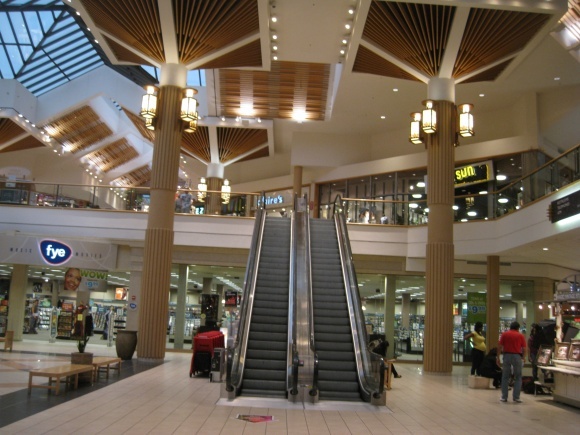 Does anybody have any color pictures of the mall before the butchering….I mean remodeling? 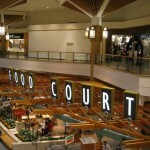 I would love to catch a few more looks of the old fountain and food court! 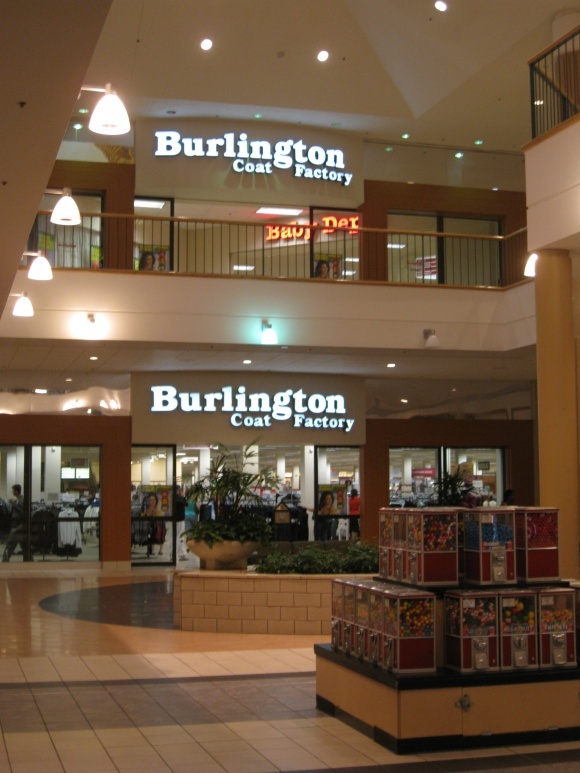 Beware The Burlington Coat Factory. Once it hits your mall.. it’s OVER. That store attracts the “low end” clientele. I recently made a visit to Stratford square as early as Dec 2013.I made some discoveries which surprised me.first I will start with the closing of ballydoyles pub.thought it was doing better and intially thought it would turn Stratford squares fortunes around.second.the Burlington Coat factorys upper mall entrance being sealed off.don’t know the reason for the decision.it unfortunately I don’t believe it will benefit either one,especially the mall.I believe in this property nonetheless and the oppurtunity for positive change and growth.especially with the soon to be jcpenney store closure.and with the mall being able to seek a loan.and getting approved.which is very beneficial.the mall occupys 1.3,million square feet.a part of everyone’s childhood especially those of us in the western suburbs can appreciate this.with the renovations of woodfield,as previously mentioned.and finally with the quad of st Chas.New project.this demands our attention.it’s time for a change and more importantly a commitment for this.Stratford will survive. 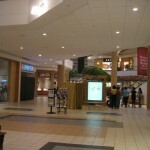 Was a very good mall, went there the other day and it looked like a ghost town! My bet he is clearing the path for BK or sells it to the housing market, but if he got some big brands back there I’m sure to see that mall make a come back! You had an arcade that did awesome now gone, bowling alley now maybe, food restaurants eh ok, you need to get more real stores and not fee market shops. …just saying good luck! It’s been over 20 years since I’ve visited SSM and I’m speechless at the changes! I was 5 when it opened and I remember with vivid detail my father bringing me there on several occasions in 81-83. As a child it felt almost overwhelming, so bright and modern yet welcoming and fun. Much like Berwyn Mike, I mostly remember the central waterfall and stepped fountains which seemed so massive and impressively loud. It just seemed like so much water! And I was fascinated by the mezzanine level as well, with its half-length escalators. If memory serves, you could walk behind the main waterfall which was always a favorite. 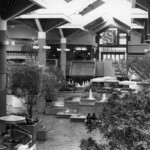 The various sunken seating areas with their fountains & ceramic figurines was a fun touch and I remember seeking them out, nestled in lavish planters. 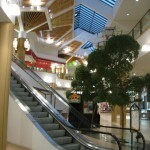 Even now, it seems like one of the best uses of materials, colors and space in a “classic” modern mall. Looking back, you can tell the original developers spent some serious time and money on its design & construction. Many of the comments reflect on how welcoming and comfortable it was. Now with the fountains, foliage and original character gone, I’m not sure I want to go back. Interestingly enough, I went back to Yorktown Mall for the first time in 15+ years just a few weeks ago & it was a similar situation. Just bland and forgettable, stripped of any details which would create any sense of place. The “Golden Age” for these types of developments has truly passed.